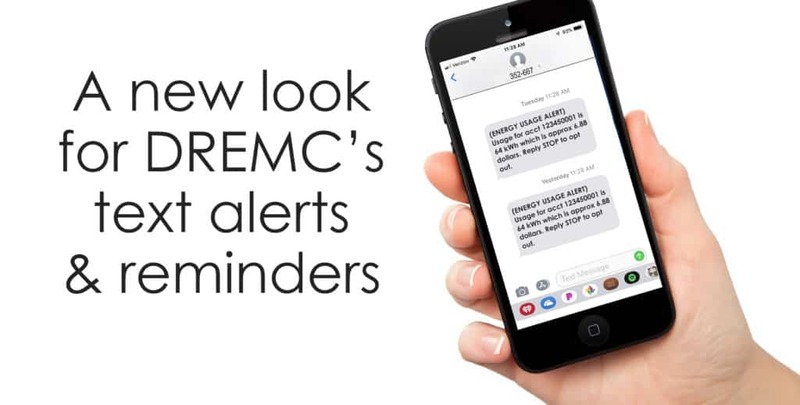 Effective March 26, DREMC’s text alerts and reminder service will now offer members two-way communication using texting. Messages will be sent from DREMC’s short code number of 352-667 rather than from alerts@dremc.com. This change applies to prepay account messages as well. It’s easy to get started with alerts and reminders! Just go to the online payment portal, or download DREMC’s mobile app to your smartphone or device. There are 11 different messaging options available, including due date reminders and outage notification. If you have questions about the DREMC text alerts and reminders, please call your local DREMC office and speak with a member service representative. *Must have a DREMC advanced meter to receive the energy use alert.